1. Define and embrace a common vision – then press forward and don’t let anything get in the way. What Greenville did: When the bottom fell out of its textile industry, Greenville had nowhere to go but up, with an abandoned downtown and rock-bottom property values. Greenville’s public- and private-sector leaders embraced a new vision, designed a vibrant new multi-use downtown, and lured transformational employers like BMW and Michelin. Greenville leaders’ motivation? To create a city their children would want to move back to. Now, that’s a goal we can share. 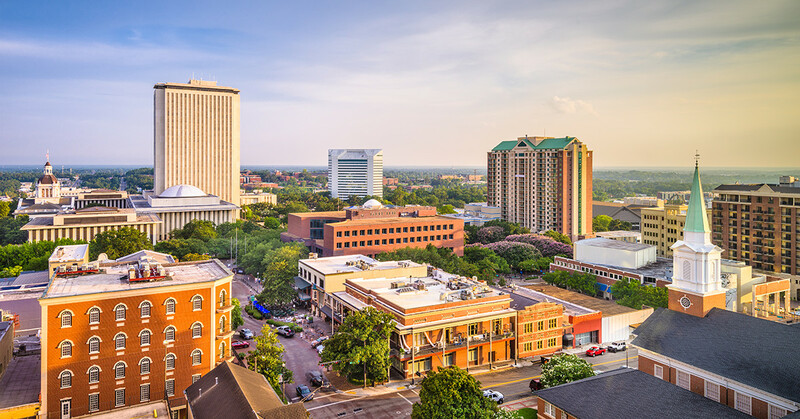 How Tallahassee can apply: Take the consensus action items from this trip – turn them into a clear vision, define measurements of progress, and use Tallahassee’s upcoming 2024 bicentennial to generate momentum for change. 2. Make the vision visual. What Greenville did: When the city was creating a vision, Greenville Mayor Knox White drew inspiration from a dramatic pedestrian bridge and a botanical garden in far-off locations. He bought illustrated books about those places and gave them to city leaders to help them visualize what was possible. Then, he paid an illustrator to bring Greenville’s own vision to life in full color. When people could see that future, they bought into it. How Tallahassee can apply: Deploy the power of illustration to paint a picture of what Tallahassee could be if we connected Cascades Park, Railroad Square, College Town, Midtown, and SoMo into a vibrant, new walkable downtown district. 3. Invest in a master plan for downtown. What Greenville did: Greenville leaders engaged a world-class urban planner to create a new master plan to transform their downtown by narrowing Main Street, widening the sidewalks, and building out mixed-use space with retail on the ground floor and residential above. How Tallahassee can apply: Build upon Blueprint 2020 plans and allocated funds as the framework for a downtown master plan. Our walkable, mixed-use downtown could be Adams St. from the Governor’s Mansion to the Capitol. We could also look at Park Avenue with an eye for additional public gathering places, parks, mixed use, and event spaces. 4. Design for mixed use. What Greenville did: Redesign downtown around mixed use – retail below, housing above. Build a variety of housing types downtown – 5 to 25 housing units above retail, not just condo towers. Create a diverse walkable shopping, eating, and aesthetically pleasing pedestrian experience. Greenville needed a critical mass of residential to attract the retail – and exceeded expectations. Downtown retail now includes Brooks Brothers and Anthropologie, and outperformed the mall last December. Greenville lesson: If you build it, they will come. How Tallahassee can apply: Existing high-rise condos provide downtown living options, but many units are owned by absentee owners who don’t provide year-round vitality to downtown. Young people want to live downtown but demand a variety of options. If we redesign Adams and Park for multi-use, with everything above street level reserved for residential, people will move downtown and retail will follow. 5. Be bold and daring. What Greenville did: The Reedy River and downtown waterfall was so polluted during the city’s textile days that it ran a different color each day, depending on the dyes and chemicals that were dumped in it. So, when the South Carolina DOT built a four-lane highway over the downtown waterfall, obscuring it, no one was sorry to see it go. But Mayor Knox had a vision of replacing the concrete highway with a pedestrian walkway bridge. That idea was ridiculed and never got over 50% support. Still, a handful of leaders stood up to the opposition and persisted. The reclaimed waterfall and pedestrian bridge are now signature downtown assets. The city’s investment of $18 million to build Fall’s Park around the waterfall attracted $118 million in private investment within two years. How Tallahassee can apply: Blueprint 2000 funds give Tallahassee the resources to make game-changing investments in our community. Let’s figure out what investments will be the most transformative, drawing the private-sector investments that will take our community to the next level. Question: Would our leaders stand up to 50%-plus public opposition to see a powerful-good opportunity through to completion? 6. Build in elements and experiences that delight and keep people exploring. What Greenville did: Greenville loaded its downtown district with elements meant to delight and encourage exploration, including statues that tell the city’s history positioned at a height for human interaction, lights and wind chimes in the trees, way-finding signs that tease other features, and even a student-led project to plant Mice on Main, encouraging a memorable scavenger hunt. How Tallahassee can apply: Create a robust downtown district that reflects Tallahassee’s personality and history, builds in lots of unexpected surprises and places to congregate, includes gardens, places to delight children, and water features to cool off on hot days, encourages exploration, uses street art that reflects our local arts community, reclaims historical buildings, and recasts places that are ugly or underused. What Greenville did: Greenville city staff was challenged to create constant reasons for people to congregate downtown, with a mandate that all Main Street events be open to the public. The outcome? More than 500 event days citywide, including 200 downtown. Street performers. A film festival. A youth literary conference. A downtown, high-quality farmer’s market. How Tallahassee can apply: Build on the successful events we already have – Springtime Tallahassee, Winter Festival, Word of South, LeMoyne’s Chain of Parks Art Festival, etc. – to grow a dynamic year-round series of events that draw our residents together and give people from outside our city an extra reason to come here. 8. Leverage our tremendous trail assets. What Greenville did: Greenville leveraged the rails-to-trails movement to create Swamp Rabbit Trail, a 15-mile trail that runs through the heart of Greenville and connects it to the community of Traveler’s Rest. The trail is so popular (it was described to us as an “interstate for young foot travelers”) that residential and retail development have grown up around it, from restaurants featuring local cuisine to a healing center for cancer survivors to craft breweries. How Tallahassee can apply: As Leon County Commissioners Bryan Desloge and Kristin Dozier enthusiastically opined, we can describe, visualize, finish, and package our largely complete trail network from Bannerman to the Capitol to the coast. 9. Use economic development to raise all boats. What Greenville did: Greenville’s economic revitalization has brought prosperity and jobs to the city. They call it “the Uplift,” which aims to raise all boats. In addition to the influx of well-paying jobs, that also takes the form of corporate partners making a long-term commitment to mentor at-risk middle schoolers to keep them on track and building elementary and middle schools dedicated to educating future engineers. It includes apprenticeship programs to prepare non-college-bound students for well-paying, in-demand jobs. But the lack of comprehensive public transportation and affordable housing prevents many from accessing the benefits of Greenville’s prosperity. How Tallahassee can apply: Plan for success by building affordable housing and public transportation into Tallahassee’s master plan for downtown. Place transformational assets in the Southside – hands-on apprenticeship programs for technical and trades jobs, maybe magnet schools for engineering and the arts. 10. Become the place where differences are met with respect. How Tallahassee can apply: Become known for bridging differences with respect and civility, not using differences as an excuse for inertia. Use Village Square as a way to tackle differences respectfully – race relations, red and blue political divides, how to balance economic growth and quality of life, bridging northside and southside economic disparities. What if we truly leverage our differences: A blue city in a red state, the home of an HBCU and one of Florida’s flagship universities and a top-ranked state college, STEM resources like the MagLab and the FSU-FAMU engineering school, and national-caliber arts resources like FSU’s top-rated theatre, music, and dance programs. 11. Call out, then ignore, the noise. What Greenville did: One member of a Greenville panel described the importance of not succumbing to the noise of naysayers and told this story: When they added a question to a poll about whether there was anything their school board could do that locals would agree with, 15% said no. The panelist described this as their signal-to-noise ratio. They determined not to let initiatives be derailed by people who would not be satisfied under any circumstances. How Tallahassee can apply: Define noise as non-productive criticism that isn’t contributing to a solution. Call it out, then work toward a common vision without allowing non-productive complaining to stop progress. 12. Set a high bar. What Greenville did: Greenville described how it insists that every development, every event, every feature meets a high standard of excellence. They call it the “Greenville way.” Anyone who notices graffiti or a pothole can call the Greenville Cares hotline and it will be fixed within 48 hours. What Greenville did: Greensville has a clear, compelling, and widely shared narrative. Even the Uber drivers could recite Greenville’s history, transformation story, and assets! How Tallahassee can apply: Tallahassee has its own assets and success stories, but they aren’t universally known, even among our private- and public-sector leaders. We can act on an idea expressed by Capital City Bank’s Beth Corum to take the 85 community leaders who toured Greensville on a similar tour of Tallahassee, inventory all assets and successes, create and share a cohesive narrative, make it visual, then spread the word. 14. Create a brand to rally around. What Greenville did: Unlike Tallahassee, which is a pretty unique name, the Greenville we visited is just one of many Greenvilles. Turns out 34 states have one. So, when Greenville’s ad agency came up with “Yeah, THAT Greenville,” the theme hit home. The slogan fit so well, it has been embraced by the whole community and is now used to promote everything from tourism to economic development to resident pride. The strategy worked well: Get others to say good things about Greenville. Then amplify. Greenville now draws 5 million visitors a year, generating $1.25 billion in economic activity – outpacing the region, the state, and the nation. How Tallahassee can apply: With our bicentennial right around the corner, it’s time for Tallahassee to define its personality and establish a brand that everyone can rally around. Visit Tallahassee’s Kerri Post is on the hunt for that theme, subject to rigorous testing to make sure it resonates. Maybe one theme will work for all uses or maybe not – but at nearly 200, it’s time to uncover our inner cool. There is so much more to talk about – the Fenway-replica baseball park that includes the home of Shoeless Joe Jackson, an independent airport authority, programs for graduate students to meet the innovation needs of corporate partners with hands-on learning, and so much more. The point is not for us to replicate Greenville or try to be something we’re not, but to learn the intangible lessons and release our own internal awesome. Let’s do this!